I originally did a post on arranging flowers in decorative tins way back at the time when I was a baby blogger talking away to myself. I think the post on vintage tins got one comment and two views! 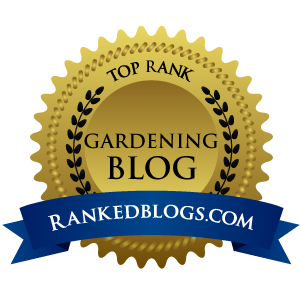 As there is nothing much blooming in my snow covered garden, I thought that I would re-show this, my favorite method, of displaying spring flowers for Garden Blogger's Bloom Day. 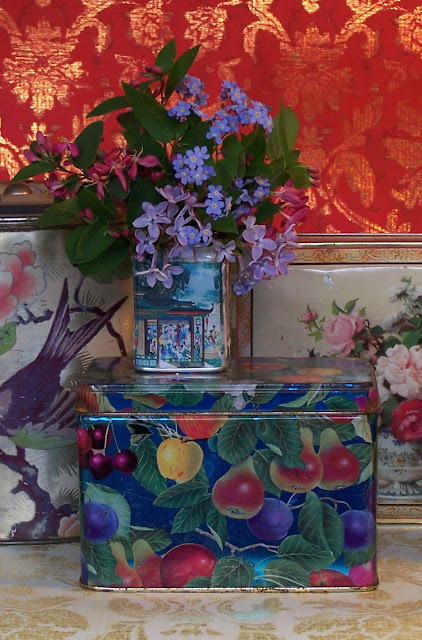 I did not set out to collect vintage tins, but I love floral patterns and collectable tins kept catching my eye at flea markets. They were so pretty and cheap, that before I knew it I had a whole collection of them. 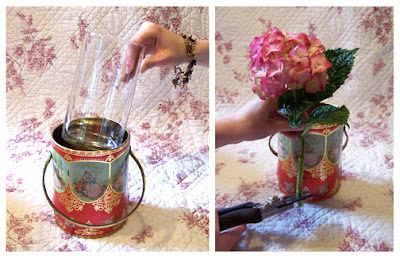 Old tin cans are not watertight and so, when I want to display flowers in them, I insert a wide-mouth drinking glass or small glass vase to hold the water. (Inexpensive glass vases can be found at most discount stores). I use the height of the tin to help me gauge the proper length for each of the flower stems. 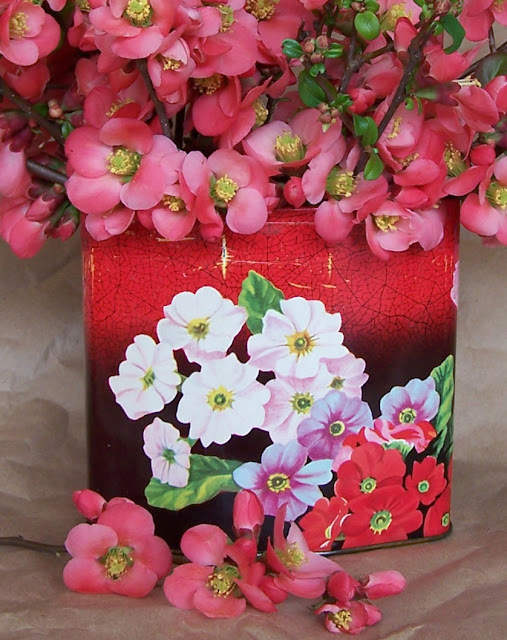 Quince flowers in a red tin. inside the tin to hold the water. This tin cost me $3. Doesn't it show off the daffodils and pansies nicely? 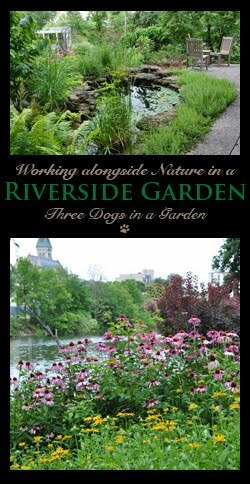 To see what is blooming in other gardens around the world on this Garden Blogger's Bloom Day, visit May Dreams Gardens. Many thanks to Carol for hosting this event. Those are inspired container/bloom pairings! Great tip about using a glass container inside. I'm a little in love with that last one especially! Oh, how lovely. They do make wonderful vases. I would never have thought about using them for that. I have no imagination. LOL! I love the look and the spring flowers. They are gorgeous! I am glad you reposted them. The combinations are just perfect! Happy Bloom Day! Dear Jennifer, How very effective these springtime arrangements look.They are well worth a second appearance on your weblog and I shall steal your idea.....immediately! Jennifer I am so glad you reposted. These are gorgeous.. the colour combo of flowers and tins so artistic. Love the hint on how to use them so helpful as well. 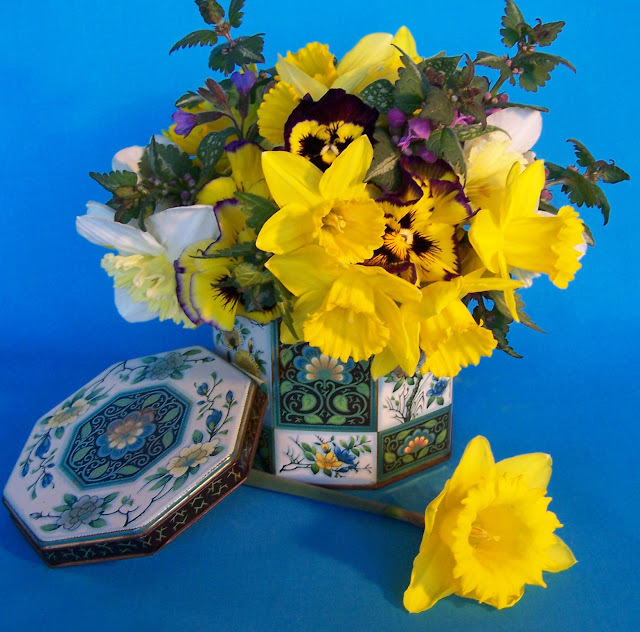 What charming arrangements - and a good tip about using a vase inside the tin. Thanks for giving us a reprise. Your header caught my eye immediately--I love these colorful tins! But they look even lovelier filled with flowers. 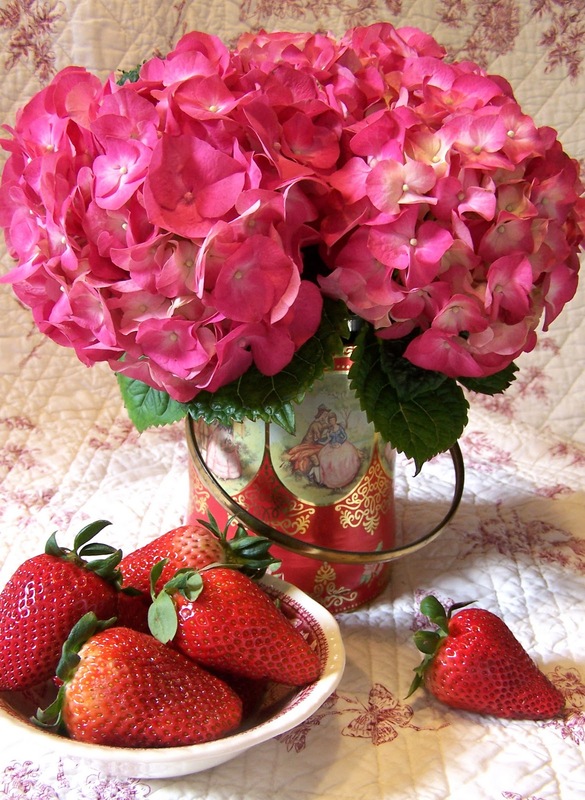 A perfect post for Bloom Day as well as Valentine's Day! I've always been very attracted to old tins, even beautiful cans from Mexico painted with advertising))). However, I am no flower arranger. You have done a beautiful job of doing that, using lovely vessels and inspiring photography. So pleased you posted it again, as a lot of the time, most of us don't make the time to go back to earlier posts. Yes, they are lovely. I have a couple old tins, so I will give it a try. I have lots of tins, I will have to follow suit (when the garden is full of blooms) I do like how yours look. I can't believe you didn't get many comments on the earlier post with the tins and blooms. Your photography is really incredible. Jennifer, this is driving me crazy, all of those beautiful flowers and the tins really set them off. I think I am going to have to do some bouquet shopping this weekend. Very lovely arrangement and I like your vintage tins. I am going to keep on eye on vintage tins on my next trip to the flea market. Thank you for those wonderful ideas. What a wonderful idea! I'm so glad you re-posted this, your arrangements look beautiful and have inspired me to get a little more creative when displaying blooms indoors. 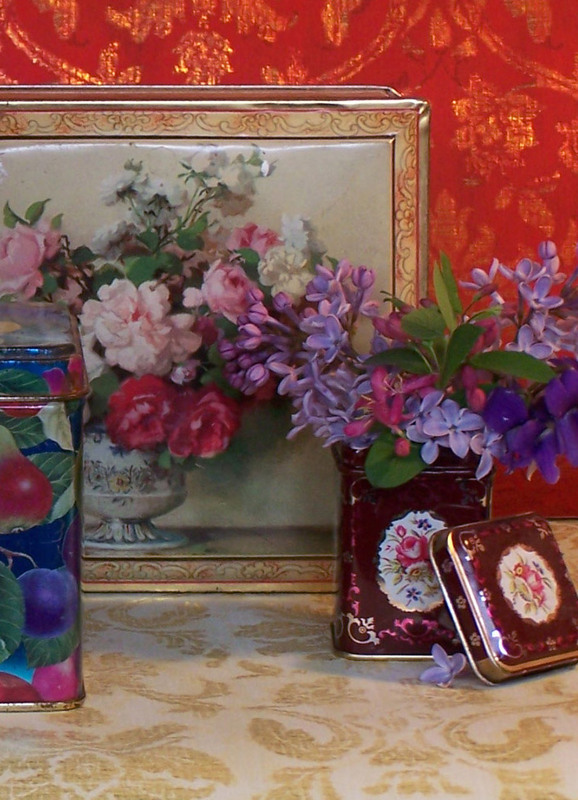 The lovely vintage tins went well with your simple but superb floral arrangements! I love the last photo, such a good pair, the tin and the bright yellow daffodils and pansies. I like how you mention to put a glass vase in there first. I am ashamed to say I have rusted out some pretty cute vintage tins by not doing that. Bedankt voor jouw lieve reactie op mijn "Valentijn". Wat een mooie vintage blikken heb jij zeg. Hele mooie composities heb je ervan gemaakt. Ik vind jouw blog erg mooi en kom vaak langs. Now in your langeage. I'm sorry. Thank you for your sweet comment on my "Valentine". 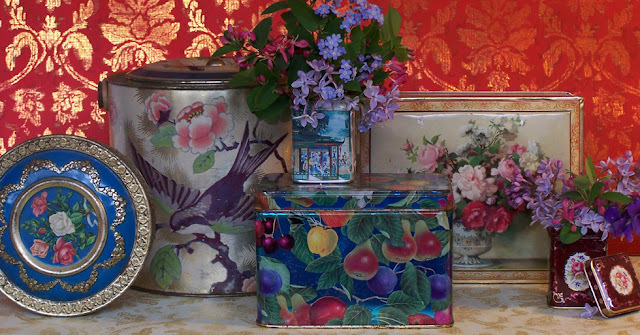 What a beautiful vintage tins you have!!. Very beautiful compositions have you created. I like your blog very much en come often along. Simply beautiful...you have a talent for design! Absolutely gorgeous!!! I love the colour palattes you chose, especially in the first bouquet. They complement the colourful tins perfectly. What beautiful arrangements!!! I'm a wreck at arranging flowers and usually just stuff them in whatever vase or jelly jar I can find. Your tins are much classier! :o) I agree with Cat from the Whimsical Gardener. You are quite the designer!! What fun and Beautiful too! 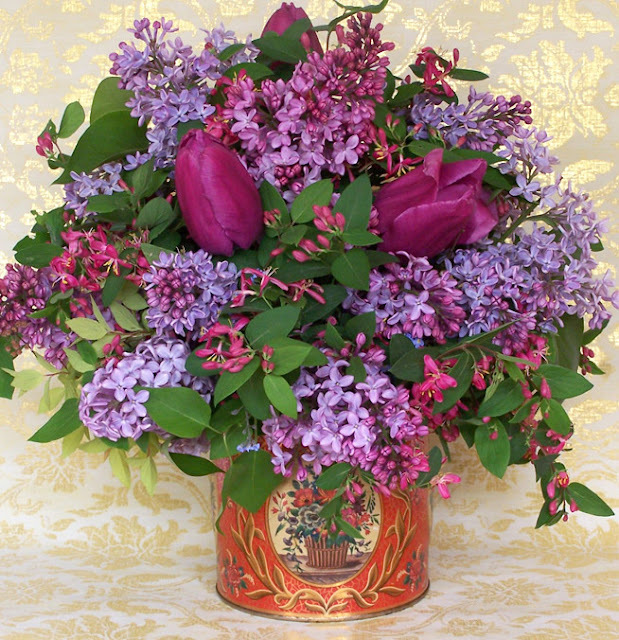 Lovely tins and blooms. Wow, you must fill those water pics up more than once a day! Stunning post Jennifer! So many beautiful tins you have and what a wonderful way to use them. Fabulous photos once again. Carol, There is just room to squeeze in a couple of water picks in my smallest tins and yes, you would have to refill them each day. Your bouquets are lovely and what a great collection of tins, too. 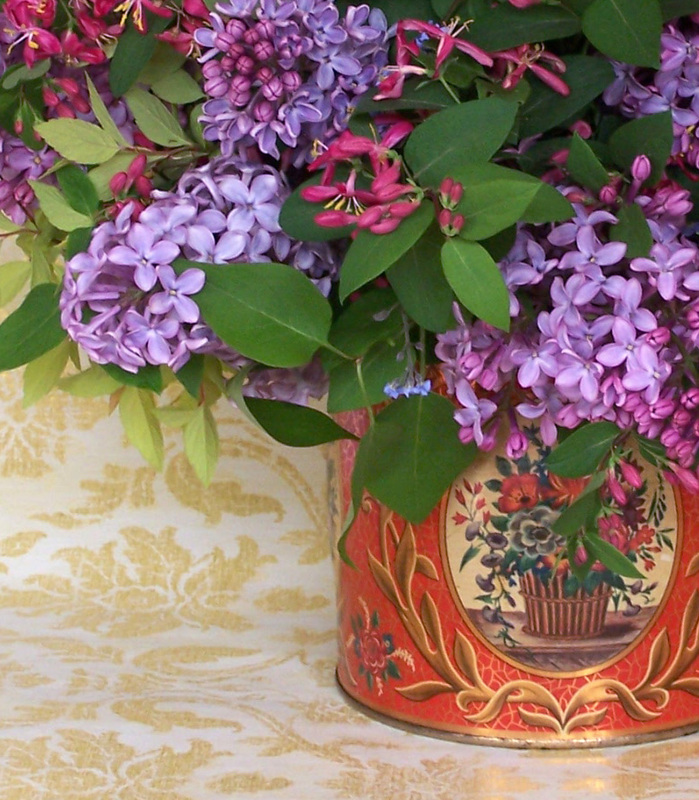 Love your tins and flowers. A lot of talent you have there to put these together to look so beautiful. Those are so pretty! I would have never thought to use tins. Thanks for showing us to put a glass inside. Detailed instruction like that is very much needed for some of us! How clever, they're absolutely gorgeous. Those flowers looks awesome . Actually i like the color of flower and way of presentation.Thanks for sharing with us . Wow - I just found your blog when googling flower arrangements in vintage tins! I've been collecting tins for my daughter's wedding centrepieces and your post has been very helpful indeed. 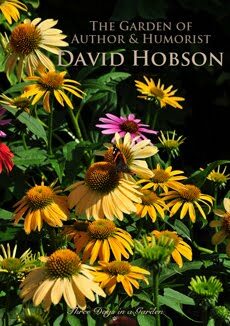 The wedding is a fall wedding so will probably be using zinnias, sunfowers etc. Would you suggest using florist's tape to create a "frog" or maybe oasis in the jars that you put inside the tins? We will be doing the flowers ourselves and hope we can make them look half as lovely as yours do! To fit inside the tins, the glass jars have to be fairly narrow with a small circumference at the top. This alone should be enough to hold flowers.